This recent ampersand logo trend has particularly caught my attention because it’s long been an obsession of mine as the quintessential symbol for my name (my initials before marriage were A.M.P.) combined with my love of writing and thus vintage typewriters. Does that make sense? Regardless, I’m a sucker for good typography design accents (I do love that Bubbles & Ink logo), so I’ve compiled a little cluster of cool pieces that I wouldn’t mind adding to my own collection. What do you think of this ampersand trend? I’m obsessed with that marquee lamp. Got any favorites? 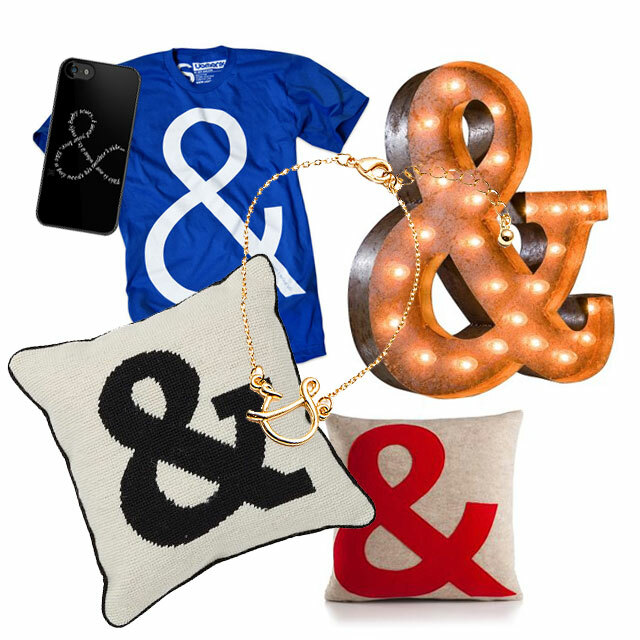 SHOP THE POST: Clockwise from top left – Of Mice & Men Ampersand Typography Logo iPhone & iPod Cases, Ugmonk “And Then I Woke Up” Ampersand Tee, Everyday Art Vintage Ampersand Marquee Light, Alexandra Ferguson – Ampersand 16X16 Pillow, PB Teen Alphabet Ampersand Needlepoint Pillow, and Accessories Boutique “And Then” Bracelet in Gold.